See therapists in Seattle, WA. Help for Family & Friends Do you have a loved one who has problems with alcohol, drugs, or compulsive behaviors? Attend a Family & Friends support meeting to learn how you can develop skills to help you cope and help your loved one choose recovery. 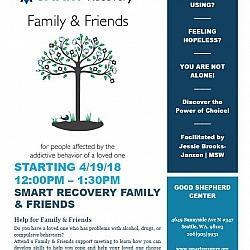 Sponsored by SMART Recovery, an organization with two decades of helping people achieve recovery from addiction with its self-empowering, science-based approach. No need to register, as this is a drop-in meeting. No fees. However, donations are accepted.